Using proven satellite technology, London Web Satellite delivers fast Internet access straight to your home. With up to 20 Mbps download and 6 Mbps upload speeds, there will be no frustration waiting around for your content or information to arrive on screen. 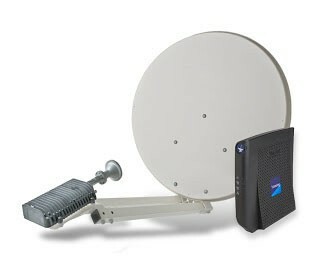 London Web Satellite gives you the best of user experience with cutting-edge technology embedded in your modem. London Web Satellite offers high-speed Internet subscriptions starting from just €1 per day, for a service more than 150 times faster than traditional dial-up, at the quality of ADSL2, for a price comparable to ADSL. Whether you need the Internet for you, your family, or your job there is a package perfect for you at an ultra competitive fixed price. London Web Satellite is available to everyone across Europe and the Mediterranean Basin, with the same great quality no matter where you are. If you live in a rural area, there is no longer any need to pay for expensive connections from your home to an existing network or wait on the promise that a modern network will be built in your area. Because London Web Satellite is delivered direct to your home, via satellite, our service is available to everyone immediately. It couldn’t be easier to get started with London Web Satellite . A small satellite dish is installed on the outside of your property. You can do this yourself or we can organise a qualified installer. You then simply plug the satellite modem into your computer and you are ready to go. There is no telephone connection required and you can be using the Internet immediately after this simple set-up.